Celebrating 17 years of great design and above and beyond service and recipient of three best rated interior design companies in Burlington (2018) and Oakville (2017), Felicia Gimza of the Expert Touch Interiors has been successfully designing and decorating homes since 2002. Best of Houzz 7 years in a row - 2013, 2014, 2015, 2016, 2017, 2018! and 2019!, a Houzz influencer and her pics have been added to ideabooks over 25,000 times, Felicia creates spaces that you won't just live with, but will love living in. No matter what your style, her skill is in interpreting your vision into a space that truly reflects your personality. The Expert Touch Interiors creates comfortable and inviting interiors, while giving you those unique touches that you'll enjoy for many years. Felicia is a proud member of the Decorators and Designers Association of Canada (DDA) and the Benjamin Moore Link Painting Network. Proud to be selected as a Houzz influencer. Our photos have been added more than 100,000 times to client idea books. And our photos and advice have been featured by the Houzz editorial staff several times. At Chic Decor we have the experience and creativity to transform your house into the home you dream of. We have been approached by the media and written up in articles for advice on design trends, most recently in The Globe And Mail. Chic Decor has been shortlisted on a number of articles detailing the top design firms to make note of. All details on our website: www.chicdecordesign.com. We provide 3D space planning solutions that allow you to see what your room(s) will look like before re-decorating or construction takes place. Oakville Award-Winning Interior Designer - Best of Houzz 2016-2017! Chelsea Cobb BA (Hons) C.I.D. 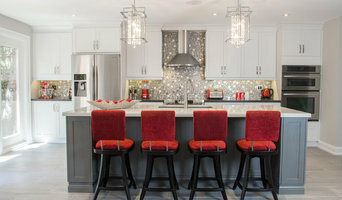 Chelsea Cobb Design was founded in 2014, a residential interior design and decorating service based in Oakville, Ontario, specializing in creating serene and elegant living spaces offering outstanding comfort and function. As a designer, symmetry, balance and proportion are extremely important design attributes to me, integral and fundamental to the way I work. With interior design, it's not so much about what you have but what you do with what you have that matters. Obviously having a huge budget helps! Making the right design decisions is key to success, and this is exactly what I love doing on behalf of all of my clients. I believe interiors can become beautiful and elegant living spaces offering outstanding comfort and function. In a world where there are endless possibilities, as your designer, I will advise and accompany you every step of the way by using a fusion of carefully chosen materials and finishes that collectively will create your perfect living space. My services include: Design consultation Space Planning Accurate and realistic floor plans and elevations Specification of custom cabinetry, upholstery and drapery Selection of fabrics, textiles and décor Sourcing of furniture and lighting Choosing and creating artwork Every client is individual and every job unique, but my work process remains the same. I bring rigorous attention to detail and communicate each design stage to my clients, from concept to completion. I am Livia Drennan, DDA Canada accredited member and colour consultant (True Colour Expert™). Creating spaces that are timeless and infused with playful elements is my passion. Each room that I design has something unexpected, either in size, colour, or placement. Beauty and elegance attract me, yet practicality is the layer behind, a layer you don’t see, but always feel. The goal is for my clients to feel at home and be happier when I finish. Only then, will my job be done! Full Service Interior Decorating and Design Professionals. Clients hire me to eliminate the worrisome details of their renovation or re-design project. I understand the need to manage your investment and to stay on budget. Working with only highly skilled trade professionals who implement our collaborative design plan, I provide my clients with an exceptional experience tailored to their unique needs. A full service design firm with over 30 years experience in the industry, Yvonne Robinson and her team are engaged in high end residential interiors, including new build and renovation projects as well as small commercial projects. A large percentage of our projects involve collaboration with local architects and custom builders, working hand in hand with them to refine the design to meet the needs of each family’s lifestyle. Taking the project through to completion by detailing built-ins, millwork and lighting, etc. we ensure the client’s specific needs are met. Truly getting to know and understand our clients’ vision is key. This has resulted in a long list of satisfied customers. Robinson Interior Design’s expertise ranges from kitchen and bathroom design, to space planning, colour consultation and full furnishing and decor installations. Coco & Jack is a full service interior design studio run by husband and wife team Steve and Alyssa Terpstra. After years of talking about working together, they were finally able to take the leap and make the dream a possibility. Steve has a passion for business and manages everything behind the scenes, while Alyssa is all about the design, and can’t get enough of space planning and fabric samples. Each project is composed to be timeless and functional, while ensuring the design is completely unique, and tailored to the clients specific needs. Coco & Jack offers turn key and boxed design services both within the residential and commercial market. The team works closely alongside the Client, Architect, and Contractor to ensure each project is completed smoothly and correctly. If you would like more information on services unique to your project, we would love to hear from you! Sylvia Camilleri Design Inc. With close to 30 years of experience, Sylvia Camilleri has a proven record for quality, service and great design. Offering Online Services and Project Management, as well as local residential in-home consultations, space planning, furniture selection, flooring, paint colour selection, lighting, window treatments and accessorizing. Staging for Real Estate sales is also occasionally offered. Commercial, corporate and hospitality design is offered. Visit our new blog at sylviacamilleri.wordpress.com Established in 1990, Sylvia Camilleri quickly became known in the Toronto area for her attention to detail and impeccable service. Many of the residential projects include multi-million dollar homes, as well as new homes in need of character. Over the past 28 years, a variety of design projects have included corporations such as Sony Music Canada, Global/CanWest, and Chartwell Reit. There have been model home projects for Sundance homes, as well as projects in the industrial and restaurant sectors. Sylvia was also voted Best Interior Designer in her area for 9 consecutive years, as well as having been featured in several newspapers, including the Toronto Star and West of the City magazine. It has been an honour over the years to assist many families and companies realize exciting design concepts. Sylvia Camilleri Design has also renovated many homes and condos which were purchased, remodelled and sold. We have a keen knowledge and understanding of how to best renovate in order to get top dollar for resale. If you're thinking of selling, and need to bring things up to date, please call us. PLEASE HAVE A LOOK AT OUR WEBSITE FOR MORE INFORMATION sylviacamilleri.com You can also check out the BLOG at sylviacamilleri.wordpress.com and other sites such as Pinterest, Instagram, and Facebook. Also, take note that the phone number on the sites redirects you to my actual phone number. This is a security measure in place by Houzz. ABOUT STACI Staci Edwards is the owner of her Toronto-based interior design firm with clients in both Canada and the U.S. and her work is nationally published and award-winning. Staci encourages her clients to live easier and more beautiful lives by creating well designed, welcoming spaces, that are both livable and luxurious. Staci’s stunning interiors always include what she calls “happy moments,” which are bits that make you smile and work perfectly as the backdrop for creating fond memories. From new construction to full renovations, Staci oversees all phases of the design process from concept to final installation, taking care of every detail and delivering a custom home that’s designed specifically for you and the way you want to live. OUR PROCESS We’ll Get To Know You. First, we’ll have a call to discuss how we can help you. Then you’ll fill out our detailed client questionnaire so we can learn more about you, what you love, and how you live so we can create the perfect home for you. We’ll Visit + Plan. We’ll visit your home or the site where your new home will be built and we’ll talk about style and functionality. We’ll create floor plans and elevations of your home, with design details, furniture layouts, colours, finishes, fabrics and more. We’ll ‘WOW’ You. During a special presentation at our studio, you’ll see the gorgeous ideas we have for your home. Once the design is approved by you we bring all of the elements together – from contractors and installers, to furnishings and fabrics – all to create a custom home that is uniquely yours. WORK WITH US Interested in working with us for your next interior design project? Whether it’s a new build, renovation, or a refresh for your home we’d love to hear from you! Please email us at info@staciedwards.ca, let us know a bit about your project, and we’ll get back to you within one business day to set up a call, so we can discuss how we can help you. Thanks! 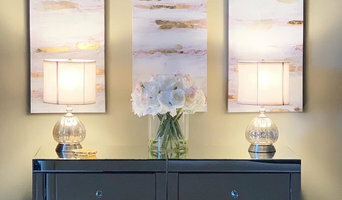 Jackie Connolly, Principal, and Owner of Parsons Interiors Ltd has been specializing in full-service residential, interior, design and decorating and since 2005. Celebrating years of great design and above and beyond service! Best of Houzz 2017 & 2018. Our phenomenal team is dedicated to creating exclusive designs that reflect each individual and their personal needs and tastes. We believe your home should be a reflection of who you are. Parsons Interiors can help you achieve that. As a member of the (DDA) Decorators & Designers Association Of Canada and of the Real Estate Staging Association (RESA), we are able to keep up with the latest trends, styles, and information. Our company's commitment is listening to our client's needs as well and making sure each is met; if not most times exceeding their expectations.